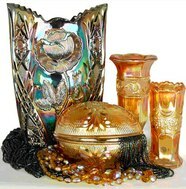 A Warm Welcome to our Carnival Glass Website! ​The information here on our website is the result of over thirty years of collecting and researching the fascinating world of Carnival Glass. We have amassed an amazing amount of information and hundreds of pictures, and we are adding to it on almost a daily basis. There is something here for everyone, from beginners to experienced collectors, covering over one hundred years of Carnival Glass production and organised collecting. ​Almost 300 pages long, covering an astonishing range of almost 800 Carnival Glass patterns from over 50 glassmakers throughout Europe. ​Patterns are identified with photos, catalogue illustrations, the reported colours and shapes, factory attributions and the original makers' name where known. ​It is a visual delight and comprehensive in its coverage! 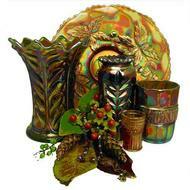 All you need to know about Carnival Glass from Europe in one place. See hundreds of wonderful pictures of Carnival Glass in our unique Picture Galleries. Perfect for pattern IDs and for appreciating truly breath-taking Carnival Glass from every maker around the world. Carnival Glass NetworK on Facebook is the place to be "at home” and relax with friendly and welcoming Carnival Glass collectors worldwide. A lively place where Carnival is featured, discussed, identified, puzzled over, and appreciated – 24 x 7! ​Carnival Glass NetworK ezine brings you all the latest discoveries and news as it happens. We look at Carnival Glass through the eyes of the people who made it, marketed it, advertised it and sold it ... and or course, the public who bought it. Go to our NetworK homepage to sign up for your free ezine and to browse all the back issues. ​Featuring the Stories Behind the Glass adding life and colour to the Carnival Glass World. Plus "Sell it to me!" and "Read All About It!" Each Classic Carnival Glass maker has their own Master Page, with links to everything about them. All in one easy-to-use place. The essential Collectors Facts on Carnival Glass patterns from all around the world, and the myriad of Carnival Glass colours. Our FAQs and our New Feature - Myth Buster! explore this most amazing glass. Bob Smith was our dear friend. He was a dedicated researcher and collector, with whom we worked collaboratively over very many years. Bob built the finest and most comprehensive Carnival Glass tumbler collection in the entire world. The collection was his life, built as a legacy to be kept intact, according to his stated wishes, as a “study / reference” collection for future generations. ​We committed to Bob that the Tumbler Collection would never be sold or broken up and that we would share it online with Carnival and glass collectors through The Bob Smith Carnival Tumbler Museum. 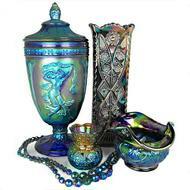 This "virtual" museum will amaze and fascinate all collectors, and spread the beauty of Carnival Glass tumblers. All thanks to the indomitable Bob Smith. Any unauthorised use of our material on this website will constitute an infringement of Copyright and Intellectual Property, and we take infringement of our work very seriously. Read more - click on the image on the right. ​and to Dave Doty for permission to use their images. ​We also get very excited about Pressed Glass from the late 1800s - early 1900s period, and we are developing a Glass Potpourri feature about it: there may even be a link to Carnival Glass (but that's not always essential). Check it out with this link to Glass Potpourri. Can't find what you are looking for? Use the Search box, top right!